Hard hitting curtain of air for web, sheet and part blowoff. A quiet, energy efficient way to clean, dry or cool parts, webs or conveyors. The Standard Air Knife utilizes the coanda effect (wall attachment of a high velocity fluid) to create air motion in its surroundings. Using a small amount of compressed air as a power source, the Standard Air Knife pulls in large volumes of surrounding air to produce a high flow, high velocity curtain of air for blowoff. 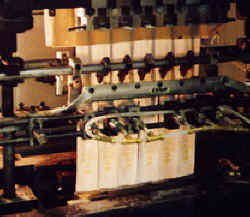 Air Knife opens mustard packets prior to fill. 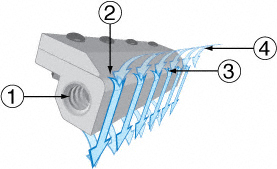 Compressed air flows through the inlet (1) into a plenum chamber (2). It is then throttled through a thin nozzle (3) extending the length of the Standard Air Knife. This primary airstream adheres to the coanda profile (4), which turns it 90° and directs the flow down the face of the unit. The primary stream immediately begins to entrain surrounding air (5), for amplification ratios of 30:1 at 6" (15cm). The Standard Air Knife dramatically reduces "wind shear" by gradually introducing the entrained air to the ejected compressed air. Noise level is typically cut in half. The result is a high velocity, high volume sheet of air with reduced noise level and air consumption. filter separator and pressure regulator. Amplification ratios (entrained air to compressed air) of 30:1 are achieved with the Standard Air Knife, compared to 3:1 for drilled or slotted pipe. Air savings of 40% to 90% are possible when replacing these "homemade" blowoff devices. Pay-out is normally measured in weeks, not months or years. The Standard Air Knife is available in six standard lengths of 6", 12", 18", 24", 30" and 36" (15, 30, 46, 61, 76 and 91cm). Special lengths up to 36" (91cm) and unlimited system lengths are available. Any number of Standard Air Knives may be installed across a given area. The use of clean air is essential. 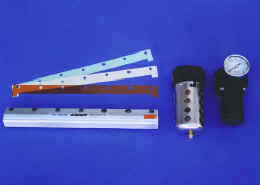 Kits include an automatic drain filter with a 5 micron filter element that is sized properly for flow. The Standard Air Knife is available in either aluminum or stainless steel construction. A pressure regulator on the compressed air supply provides infinite control of flow, force, and air consumption. Kits include a pressure regulator that is sized properly for flow. and flow through the Standard Air Knife may be easily increased by adding shims to open the gap. Kits include a shim set (three additional shims). per Inch Velocity @ 6"